Are you looking for a delicious salmon recipe with a difference? If you are, you’ve found it! 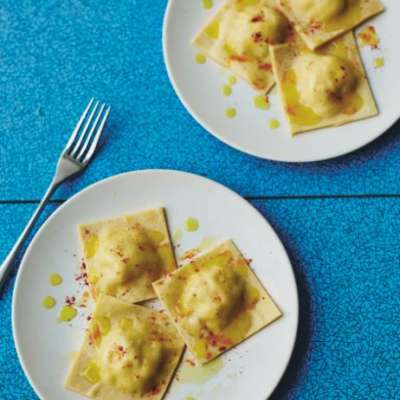 Here’s my ravioli filled with smoked salmon & ricotta for you to enjoy. When I was a child, eating smoked salmon was always a massive treat because it was so expensive. It’s cheaper now, but still fantastic. Just take care when seasoning the dish because the salmon is already salty. 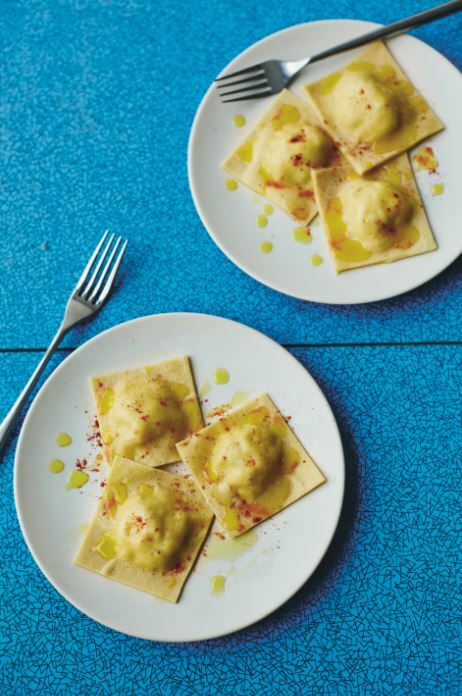 Feast your eyes on the finest ravioli filled with smoked salmon & ricotta! It’s straightforward and fun to make this great dish. Simply follow the instructions below and get the perfect result. First make the filling. Place all the ingredients in a large bowl and mix together with a fork. Season with salt and pepper. Cover with cling film and refrigerate for 10 minutes. Flatten the dough so that it can fit through the rollers of a pasta machine. Flour lightly on both sides and pass it through the machine several times, from the widest setting to the thinnest. Keep it floured at all times. If you don’t have a pasta machine, roll the pasta by hand with a rolling pin on a lightly floured surface until it is 2mm thick. Lay the pasta sheet on a well-floured surface. Put teaspoonfuls of filling at 4cm intervals across half of it. Brush the spaces between the filling with the beaten egg. Fold the empty half of the dough over the top and press down between the mounds of filling to make self-contained parcels. Use a pastry wheel or knife to cut between the parcels, leaving a 5mm border around each one. Cook the ravioli in a large pan of salted water for 3 minutes (doing them in batches if necessary). Drain and place on a large serving plate. Season with a little salt and pepper, drizzle over the oil and sprinkle with paprika. Once you’re done, simply sit back and enjoy your ravioli filled with smoked salmon & ricotta and don’t forget to check out other great authentic Italian recipes including great antipasti recipes, Italian pasta recipes, Italian soup recipes, Italian beef dishes and authentic pizza recipes.